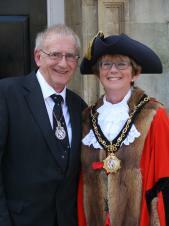 Brackley Town Council is pleased to announce that Councillor Fiona Baker has been elected Town Mayor for 2016/2017 following the Annual Meeting and Mayor Making on Saturday 7th May 2016. Consort to the Town Mayor is Mr Colin Baker. 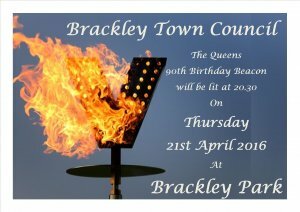 A beacon to celebrate the Queen's 90th Birthday will be lit at 8.30pm on Thursday 21st April 2016 in Brackley Park. 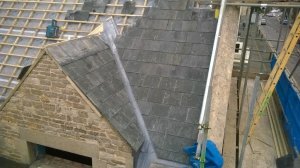 Work is progressing on the refurbishment project for the old Fire Station with the roofing slates being relaid after a waterproof membrane has been added. Work is on target to be completed in May and the Council is in the process of appointing agents to find someone to take on the cafe lease. The builders will be moving in to the old Fire Station on the High Street on 4th January to begin the refurbishment work. 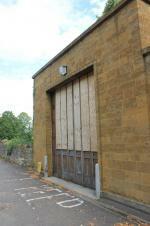 Art Contracts Ltd of Banbury will be busy converting the building into a community room, public toilets for the park and a cafe. 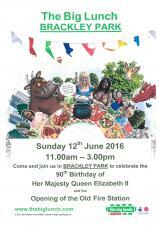 The work will be finished in time for the summer events in Brackley Park. 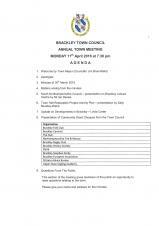 Brackley Town Council has just been approved as a Quality Council under the new Local Council Awards Scheme. Come along and join us for a traditional sing-along of festive favourites, accompanied by Brackley & District Band. 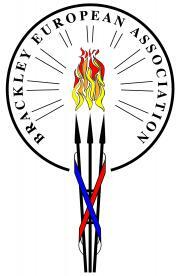 Warming mulled wine will be provided by Waynflete Lodge and food available from Brackley Butchers. Santa's Grotto opens at 4.30pm in the Town Hall. 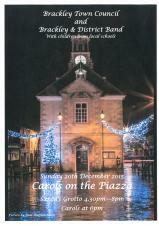 Singing on the Piazza starts at 6.00pm. With the town growing rapidly, and with a number of major projects to consider, the Town Council has for the first time prepared a draft Five Year Business Plan. We would welcome your comments on the plan, either by e-mail or in writing, by the end of November so that the Council can take your views into accounts when setting its budget for 2016-17.